We all have accidents, whether through spillage or leakage or through ‘accidents’ involving children or animals. There are several options to deal with such unsightly spots and stains. You can ignore them and pretend they don’t exist, you can rearrange the furniture to cover them up, or you can attempt to clean them up yourself. 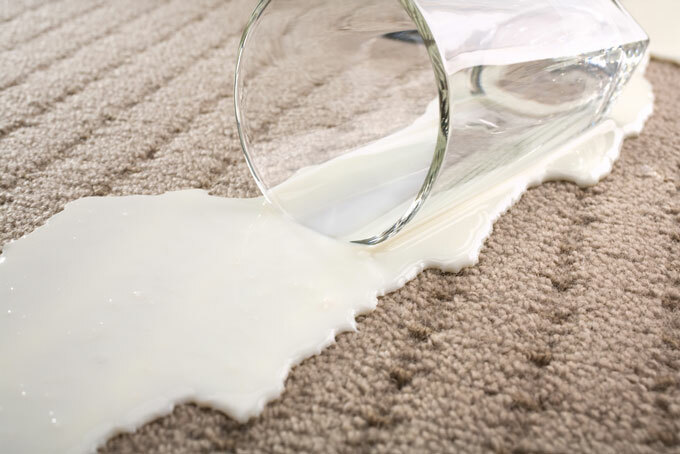 If you drop or spill something on your carpet (or upholstery), your first instinct is to grab something to try and remove it as quickly as possible. The first thought is to obviously wipe it up, and then maybe go to the cupboard under the sink to use a cleaning product that may be inappropriate, even though it may say that it is a carpet cleaning or stain removal product on the label. Unbeknown to you that ‘All in One cleaner’ that you purchased from the supermarket and hope is going to rescue your carpet, could contain something very harsh that might not only LOCK the stain in but actually ruin your carpet, with NO possibility of returning it back to how it should be. At The Rutland Cleaning Company we have undertaken extensive training in Advanced Stain Removal and have a specialised ‘spotting’ kit containing over 15 spot removal products and a dedicated CFR Pro Spotter extraction machine. Whilst we cannot guarantee to get every spot or stain out of your carpet or upholstery we can guarantee that nobody will try harder. The next time you have an ‘accident’ mop up the offending substance with a damp towel by using a blotting action. Never scrub the carpet. Keep blotting until there is no further transfer of the stain to the towel. Then call The Rutland Cleaning Company and we can advise on what further steps to take, and if required attend to professionally remove the stain.